i’ve started something new for me, filling some A4 pages with a simple black pen. I wanted to spend more time next to my cat Bouba while he’s having morning sunbaths and for obvious reasons, it was the easiest kit to use. Thanks to him, i made around +20 pages for now. Meanwhile, i continue to work on the many paintings i have in process, we mature in parallel. 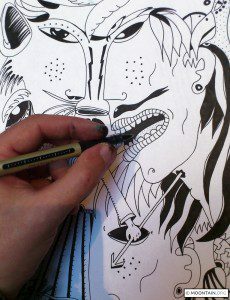 As well as some new drawinks you can check in the gallery or support on Facebook. Also, i continued to work on my rough wood sculptures, some are almost over. so now i am able to show my limited edition prints series ( more to be added ) as well as other kind of things in the future. This was something i really needed, since i don’t sell my original paintings. I wanted to have something i can share with people who would like to have some of my artworks with the greatest quality and mutual respect possible ( especially since i’ve discovered a website took some of the pictures i put online, to sell as “posters “, what they do is illegal and cheap, a real shame ). Make sure to look at the description of the prints in the shop, the main point here being, what i propose is real pro’ since i don’t make the prints out of basic camera files but ultra HD scans. This opportunity was offered to me, thanks to Debra Muzikar, a nice person doing a wonderful job at running ” The Art Of Autism “. Three of my prints will be showed during this event, as well as a short portrait in their catalogue. It feels okay to be a part of it, since ” integration ” has always been an challenging adventure for me. "The More You Know, The More You Get To Know"